I fell head over heels in love with the ultimately expensive Gucci Crocodile Hysteria Bag. The price is not practical for me at all, but the color, the feel, the shape, was beautiful. I kept staring at it and studying it and I truly think the SA thought he made a huge sale that day. Unfortunately I was just an oogler, not a real buyer. And last week I went to Gucci Bal Harbor and fell in love again, but this time that bag is more affordable, relatively speaking. 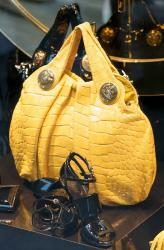 The Gucci Hysteria Bag is designed with yellow/white patchwork on the front of the bag with black leather on the back. The leather is ultimately sumptuous. I mean super soft, the kind that just melts as you touch it. I kept grabbing the bag thinking it was from Bottega Veneta, not Gucci. This bag has me back on Gucci’s side, in love with a bag that is absolutely fierce. The body is very slouchy, actually allowing the bag to fold over if you carry it with the messenger strap. 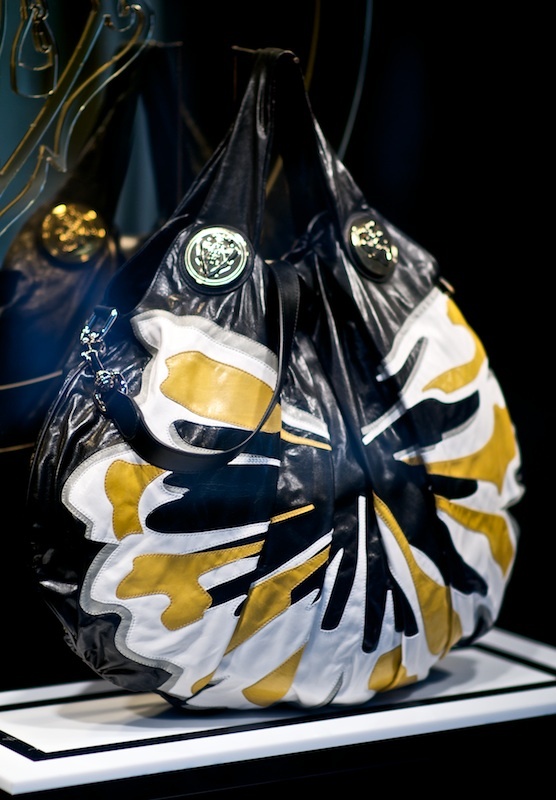 The Hysteria bags feature Gucci Crest detail. There was still one more of these available at Gucci Bal Harbor but you can also find it online via Bergdorf Goodman for $3150 or plain patent via Saks for $1790. The craze over the Gucci USA Flagship opening was unprecedented. Many people wanted to see the store, but most wanted to grab one of the coveted Gucci Loves New York bags. This limited edition line of bags are completely sold out, but the excitement surrounding the store still exists. Today we wound down with a trip to Gucci, as it is about half a block away from our hotel. The store is HUGE. Floor one carried many bags, but floor two and three did not disappoint either. The thing is, lately I have not had much love for Gucci. The brand is one of the most recognized luxury houses in the world, and while their ready-to-wear has been amazing, the handbags have been lacking that special touch that I need. The Hysteria line brings a fresh touch to Gucci, giving it the extra nudge that it needed to get me back on board. The Gucci Hysteria line drops the expected Gucci GG logo and brings in the family crest. The emblem adds the perfect touch that is not expected but much appreciated. And with New York being the new US Gucci flagship, the handbag selection is to die for. I have never seen so many exotic Gucci handbags. Everywhere we turned there were ostrich bags, python jackets, and crocodile skins. My absolute favorite was the $300,000 Gucci Crocodile Trunk. The trunk is a taupe crocodile and a stunning collectors piece (not to mention it is the only one of its kind). Going along with the crocodile craze, Gucci took one of its best bags of the season and dressed it up in yellow crocodile, creating the Gucci Crocodile Hysteria Bag. This is unlike any other Gucci bag I have seen in the longest time. The crocodile is buttery soft as it is taken from the belly of the crocodile. The inside is lined with goatskin that is even more supple. In fact, if they could make me a big pillow out of this exact material that would be heaven. This bag had the perfect slouch, the perfect chic feel, and the color was stunning. Only problem (for me at least) is the $37,500 price tag. I love this bag, love it so very much, but the price tag is way out of my range. Instead I could settle with the goatskin version ($1950). Saks also offers a python version for $3990 and a patent version for $1790 via Saks.